The sound is coming from Rivers. He is a divemaster and prides himself on not needing to make a lot of noise underwater to call attention to something, so if he is setting off his rattle, something is up. My first thought was- he has spotted an octopus. I was partially right, it was two! The male is obvious, the female is harder to see. His two leftmost arms are touching her. Octopi (Octopuses, Octopodes, more than one octopus) are territorial creatures, and if there are two of them together, it is for one reason only, octopus love! I have long been a fan of the octopus. (See previous octopus post here ) One of my cherished memories is getting to watch octopus mating while we were on a night dive in Thailand. I never planned on seeing that again, so this was a very special treat. We were diving at the Salt Pier in Bonaire, one of my favorite dive sites due to the abundance of fish there. (Check out my post from last year). We were finishing up the dive when Rivers started rattling. I was able to film the first few minutes before my camera went black. I knew the battery was getting low so I made the assumption that the camera turned off. The fact is that my camera blacks the screen out after a while and yet continues shooting. Therefore I had a short video of the octopi, and a very long video of my hand holding the camera. Lesson learned. 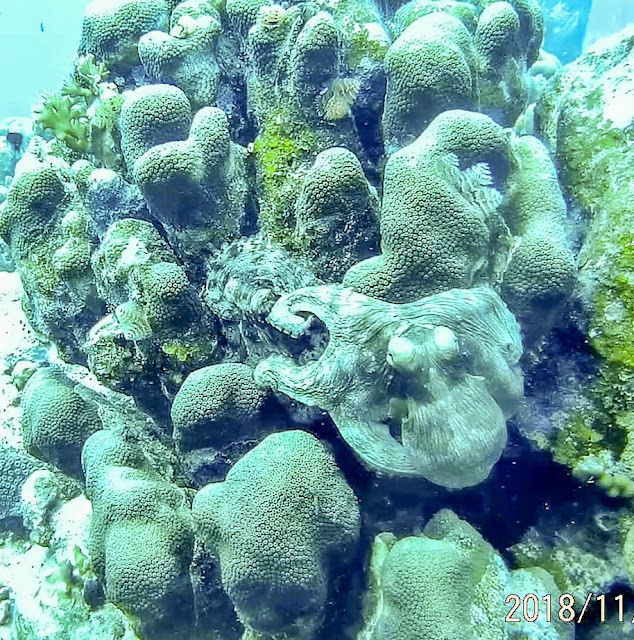 We watched the octopuses for almost 20 minutes before moving on, I will just have to describe the portion after the video. The male used one of his arms to insert himself into her pouch. She remained quite still while he was more active, at least with one arm. After about 10 minutes he spread himself out, flashed white and withdrew his arm. The female raised herself up and started swimming away. The male immediately reached out one arm, attached it to her body, pulled her back to the rock and began the process again. This no longer felt as if it was consensual, she had obviously tried to get away and was dragged back. Other than feeling for the female wanting to get away, it was amazing to watch. I feel lucky to have had the opportunity to see this again. Both times I have seen this I have been with both Bob and Rivers. Glad to have the chance to share it with them.